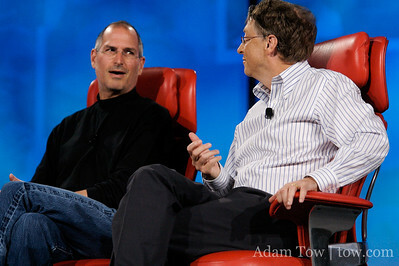 The highlight of the D5 Conference last week was without a doubt the joint interview of Steve Jobs and Bill Gates. If you haven’t yet seen it, the video is available in audio and video podcast form on iTunes, and you can see highlights on the AllThingsD.com. The D5 site also contains the complete transcript and John Paczkowski’s live blog of the event. The interview been covered all around the blogosphere and was even mentioned at last night’s event at the Computer History Museum. I want to talk briefly about the media workflow that we used during the conference. The goal of the D5 website was to be the best source of commentary, photos, and video on the web. Because media would be coming in from and used by multiple groups — Asa Mathat for photos, Fourth Wall Media for digital signage, Kodak for poster prints, Trillium for video, and John Paczkowski for commentary — close coordination was needed between everyone. My role at the conference was to make sure the site was working properly and that content got up in a timely fashion. At the beginning of each session, the ATD staff began writing a new post for the current speaker. Within the first few minutes of the talk, Asa delivered a few photos which his assistant (and wife) imported and annotated using Photo Mechanic and iView. These photos were then rsynced to a hard drive operated by Fourth Wall. They had their own crew selecting and processing images that would be displayed on the large-screen monitors throughout the hotel. They also supplied these images to Kodak, who were printing and hanging large prints outside the Grand Ballroom following each session. As for me, I created iView catalog that updated whenever new files were added to the repository. From there, I selected the ones that I wanted to post to the website and imported them into Aperture. If necessary, I performed some quick adjustments to the image before captioning the photos. Finally, I uploaded the images to SmugMug (using the Java web uploader) and used a customized version of my WP-SmugMug plugin to display the images in WordPress. As more images came in during each session, I repeated the process of (1) importing and selecting in iView, (2) processing and annotating in Aperture, and (3) uploading to SmugMug. Video was handled a little differently than photos. There were typically three sessions before a break, during which time we received a hard drive containing QuickTime movies of the previous talks. Our video editor used John’s blog posts as a guide to create a five minute highlight reel for each session. Ali did a fantastic job at quickly editing down and exporting the videos so we could upload them to our video provider, Brightcove. From there, we tagged each video and updated the blog post with a link to the video. With the exception of the Gates-Jobs interview, each session resulted in one blog post, five to fifteen images, and a five-minute video. For Gates-Jobs, we created a five-minute highlight reel and had the entire session available in seven segments. Eventually, we were able to deliver Apple a version that they then used to create the video and audio podcast. Last I checked, the podcast was one of the most downloaded podcasts on iTunes this past week! If this workflow sounds a bit complex, it was. That said, everyone involved in the conference was top-notch and worked really well together. Of course, there’s room for improvement, but that’s what D6 is for! I think we’ve seen a glimpse at how conferences will be run in the future. Near instant availability of commentary, photos, and video will become the norm, rather than the exception, for conferences. Fortunately, I had some time to sneak out of the control room to watch the talk live in the Grand Ballroom. Seeing Jobs and Gate on stage in person was far more interesting than watching it on the TV in our room. 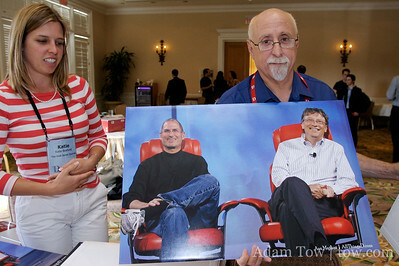 The photos below are from Jobs’ solo interview with Walt Mossberg and the joint interview with both Kara and Walt. Enjoy! Thx again for all the coverage at D5. Out of curiosity, did Walt and Kara rehearse their talk with Jobs/Gates at all? Did they know the questions ahead of time? Man, Kara’s questions were really annoying.